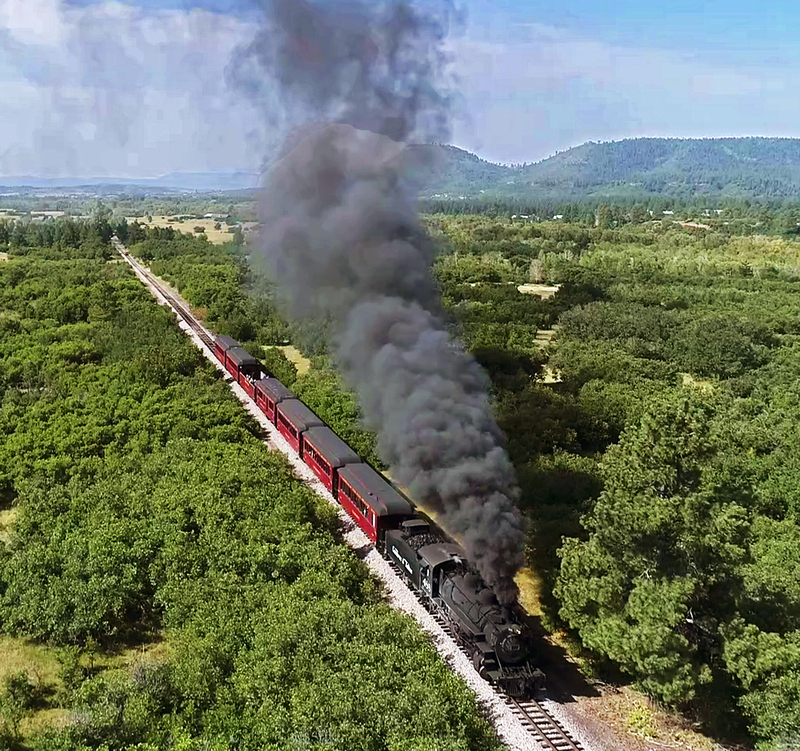 The scenic journey unfolds as soon as the train, pulled by its powerful locomotive, leaves the Chama, New Mexico station. In just moments, the steep 4% climb into the mountains begins. First, is a remnant of the historic Lobato sheep ranch, an area of rolling meadows with a high trestle that spans the rushing Wolf Creek below. Thin, white aspen trees with shimmering leaves line the grassy hills and deer, elk, and bears are plentiful. At 10,015 feet, Cumbres Pass is the highest mountain pass reached by rail in the United States. As the train climbs ever higher, the view backward reveals the entire Chama Valley. 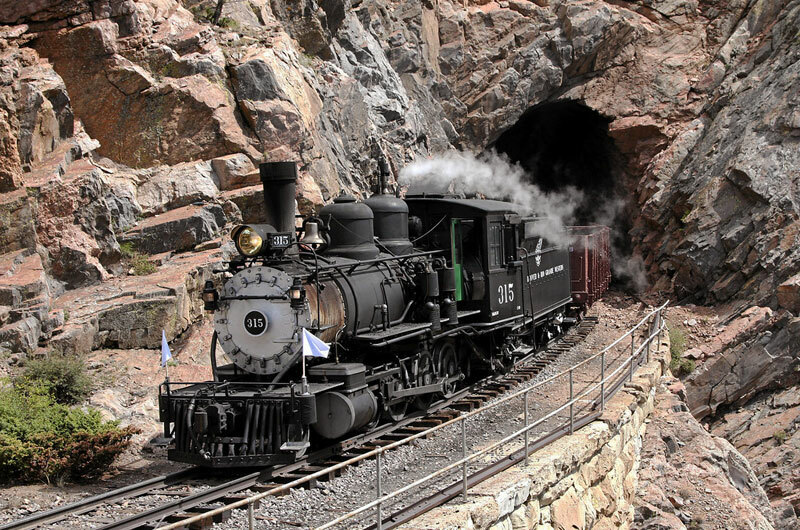 Soon, the climb gets steeper—the locomotive is working its hardest to pull the train to Cumbres Pass.The train hugs a sheer rock face as it reaches the summit, where there are alpine meadows sprinkled with wildflowers. The aspens have given way to tall, dark green conifers that frame the spectacular vistas. Here it is noticeably cooler and there can be snow flurries even in summer. One of the things that makes the Cumbres & Toltec Scenic Railroad unique is that many of its original buildings remain along the route. At the top of Cumbres Pass is the historic Cumbres section house. 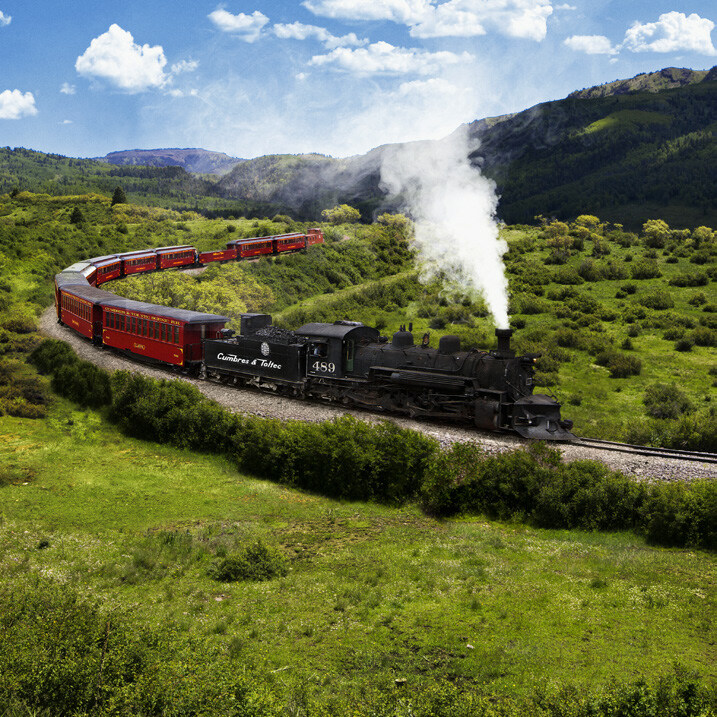 Soon after Cumbres comes Tanglefoot Curve, a loop so tight that it almost seems the locomotive will meet the caboose. Trees are sparse and there are vast mountain views crisscrossed by streams teeming with fish. After crossing Cascade Creek Trestle, the highest on the line, the train pulls into Osier, Colorado, a rustic townsite that is the midway point and lunch stop. The abandoned section town, Sublette, New Mexico, is still used as a water stop for the steam locomotives. Leaving Osier, the train approaches Toltec Gorge. At times, rock walls seem almost to squeeze in from both sides. There are two long tunnels, Mud Tunnel and Rock Tunnel, and Phantom Curve, named for a rock spire that casts a ghostly shadow. The rocky gorge plunges 800 feet and the train snakes carefully along a narrow ledge where the view is straight down. 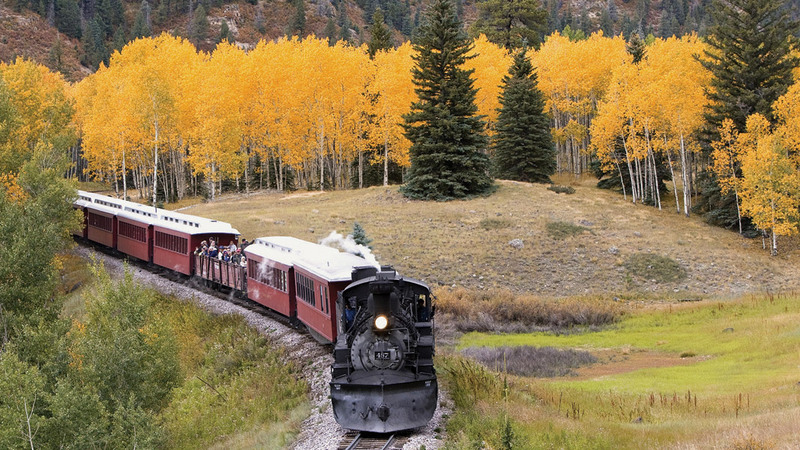 From here, the terrain softens into hills as the train descends through the aspen trees. Ahead lies the majestic beauty of Colorado. Soon the hills flatten into a broad plain punctuated by distant high peaks and the train rolls into its terminus at Antonito, Colorado. The excitement begins the moment the train leaves the station in Antonito, Colorado. Beyond the vast, open San Luis Valley, the imposing peaks of the Rocky Mountains seem to stretch forever. The train quickly covers the flat ground and reaches a series of hills. It crosses Ferguson’s Trestle, named for a man who was hung there, then climbs to a lava mesa, a remnant of the mountains’ volcanic past. From here, the route winds around wide curves, going up into the mountains. 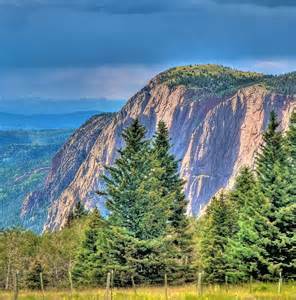 Wildlife is abundant in this area, with bears, elk, and deer roaming the forests and hawks and eagles patrolling the sky. White-barked, slender aspen trees, which turn yellow-gold in fall, form a light, whispery forest. 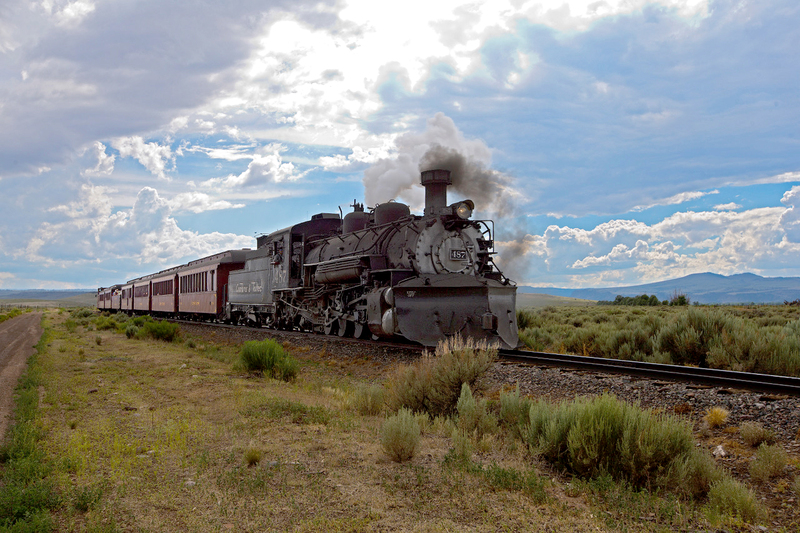 We’ll pass Sublette, New Mexico, an abandoned railroad town that still provides water for the steam locomotives. Shortly after, the train makes another crossing between Colorado and New Mexico state lines. Can you count all eleven? One of the most spectacular parts of the trip starts as the train inches its way along the rim of Toltec Gorge. We’ll head through Mud Tunnel, which is supported by wood beams. Around Phantom Curve, named for a spire of rock that casts a ghostly shadow, then through Rock Tunnel is a narrow ledge where the dizzying view is straight down to the rushing Rio de los Pinos. The train roughly follows this river along much of its route. The 800-foot deep walls of the Toltec Gorge are steep and rocky and at times the train seems almost pressed in by rock on both sides. We’ll stop for lunch at the old townsite of Osier, Colorado. 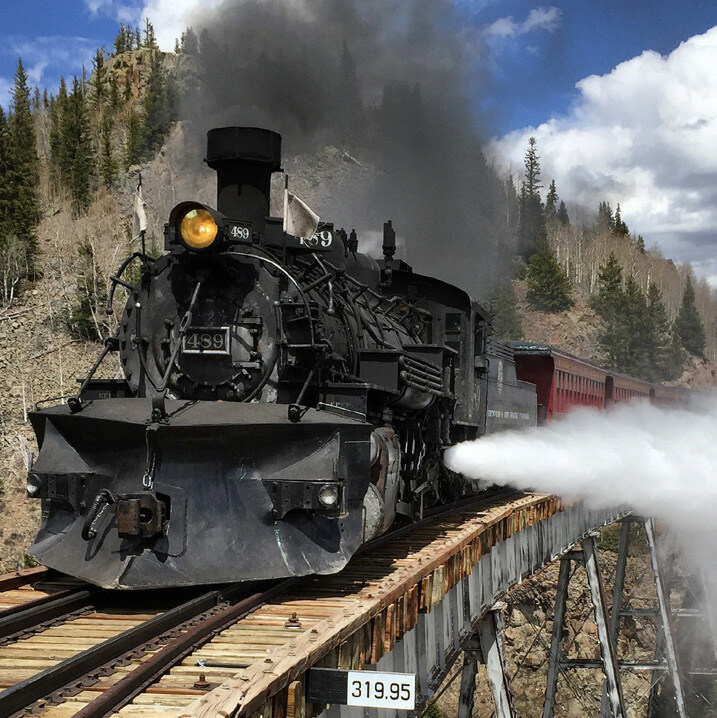 Past Osier, the train first crosses 137-foot-tall Cascade Creek Trestle, the highest on the line. Trees are sparse here and the open mountain scenery is magnificent. 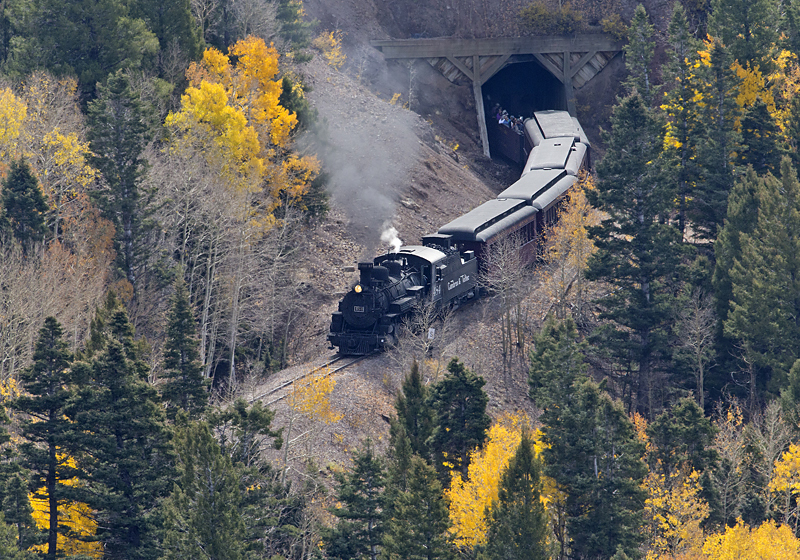 Around Tanglefoot Curve, a loop so tight that the train seems almost folded in half, the locomotive steams toward Cumbres Pass. At 10,015 feet elevation, it is the highest pass reached by rail in the United States. There are tall conifers and meadows that bloom with wildflowers in spring and summer. At the summit is an old section house, one of many of the railroad’s historic buildings. As the steep descent begins, sweeping views of the Chama Valley unfold. The lower elevations are dominated by aspen trees and grassy hills. Just past the area that was once the historic Lobato sheep ranch is the Lobato Trestle. This trestle spans Wolf Creek. Chama, New Mexico, the end of the rail, is just ahead.